Commemorating the 150th anniversary of Lincoln’s death, LIFE editors have produced an astonishing volume of images and essays. Drawing on historical archives, libraries and the collection of Keya Morgan, a foremost collector of Lincoln photographs, the editors have selected 250 images, many never before published. Distinguished Civil War historian Guelzo (Gettysburg: The Last Invasion, 2013, etc.) 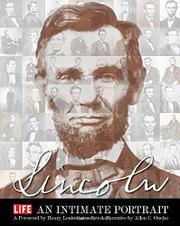 contributes an authoritative seven-part biographical essay chronicling Lincoln’s birth in a “miserable habitation” in Kentucky; his years as a postmaster, shopkeeper and surveyor in Illinois; his four terms in the Whig minority of the Illinois state legislature; his apprenticeship as a lawyer; marriage to Mary Ann Todd; the loss of three of their four sons, and his wife’s “growing unhingement.” Yet he rallied forcefully in speeches and debates. As his rival Stephen A. Douglas remarked, “I’ve met him at the bar, I’ve met him on the stump, and I want to say to you, my friend, that he’s a hard man to get up against.” Central to this volume are 130 portraits from Morgan’s vast collection, including the earliest known image, a daguerreotype made in 1846 by a pioneering photographer; a Mathew Brady carte de visite used in Lincoln’s presidential campaign; and many more Brady images, some made just after Lincoln’s inauguration, others in 1864. Also included is a moving introduction by cultural historian Henry Louis Gates Jr. and a variety of contributions of 272 words (the number in the Gettysburg Address) reflecting on Lincoln’s legacy—among the respondents are Jimmy Carter, Bill Clinton, George H.W. Bush, Lech Walesa, Ken Burns, Billy Collins, high school students and soldiers serving on the U.S.S. Lincoln. One idea recurs: “[W]e can be better than we have been,” as Steven Spielberg puts it; we can “be uplifted and galvanized by this suffering man who was a steadfast optimist in the name of freedom and equality.” That sentiment infuses and inspires this stunning portrait.